The Basic 8 Lawn Program gives you a healthy green lawn without all the work. 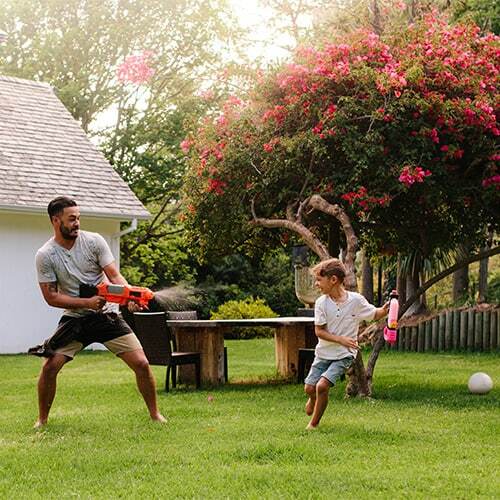 A beautiful lawn not only makes spending time outdoors more enjoyable for you and your family, but it also adds value to your property. Lawn Masters works hard to find the next best thing in lawn treatment, and we regularly test new products at our facilities that will make your lawn even better. You can count on the experts at Lawn Masters to take care of your lawn like it was our own. With the Basic 8 Lawn Program, our technicians will treat your lawn every 4-5 weeks from February until early December. We apply different treatments at different times of the year for maximum benefit to your lawn. Each of our clients gets customized lawn care. If your lawn is having a specific issue or the weather calls for a different treatment than we would normally apply for that visit, then we will rearrange the treatments to handle the current problem. We won’t stick to a rigid schedule just because it’s a schedule – we do what’s best for your lawn every visit. There are several parts to the Basic 8 Lawn Program. These treatments will be applied throughout the year at the appropriate times to keep your lawn looking its best. We will apply fertilizer to your grass early in the year to give it a head start after winter. Our technicians use granular, slow feeding fertilizer because it’s not healthy to feed the grass too fast. Often, when homeowners try to use store-bought fertilizer, it feeds the grass too fast and ends up causing more harm than good. So leave it to the experts at Lawn Masters to give your grass the best food! In addition to applying fertilizer, our technicians will also apply broadleaf weed sprays to help cut down on weeds like dandelions and clover. 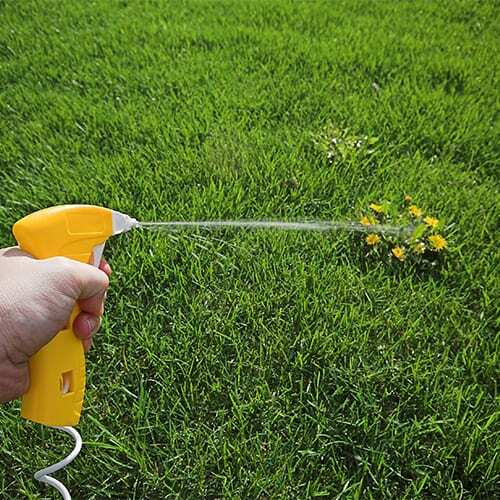 The weed spray is applied throughout the year as necessary. In the spring, we will apply a product to prevent crabgrass from growing and taking over your yard. Crabgrass is an aggressive wild grass that germinates in late April and will grow all summer into September. It can choke out the good grass in your yard and leave you with bare spots if it’s allowed to grow too long. Our product keeps away 85-90% of crabgrass – unfortunately, nothing can keep it away completely. However, our technicians will be vigilant for any signs of crabgrass throughout the summer and will take action to remove it as necessary. Many yards have a summer invader called yellow nutsedge. It’s a type of wild grass that is a light green color and grows quickly. You may notice when you mow your lawn that certain patches have grown two inches taller than the rest in just a few days. Yellow nutsedge grows in patches and is hard to get rid of if you just pull it. Our technicians apply a spray to keep the unwanted grass down throughout the summer and kill the seeds (called nutlets) to keep it from coming back. There are many insects that like to snack on your grass. They can do a lot of damage and turn your lawn from a healthy green to an ugly brown. The Lawn Masters technicians will spray for insect control to keep away pests like caterpillars, sod webworms, armyworms, cutworms, and many more. Grub worms are another invader that can damage and kill your grass. They like to eat the roots of the grass, which causes it to turn brown and die. Sometimes grub worms can do so much damage to the roots that you can pick up a section of your lawn like a rug! To keep this from happening, we apply a grub control spray in late May or June to give you 12-month protection from grub worms. Our treatments are fully guaranteed between visits. If you notice a problem before your next visit, like weeds starting to pop up, we’ll send one of our technicians back out to take care of the problem. If one of our Basic 8 customers has a question about their lawn or landscape care, we’re happy to come out and look at the situation at no extra cost, even if it’s not about the Basic 8 Lawn Program. Lawn Masters is dedicated to giving you the best results and best customer service. Can I start the Basic 8 Lawn Program at any time? You can start the program at any time, but it’s ideal to start in February for your lawn to get the full benefit. If we start later in the year, it can be harder to get the best results since we weren’t able to apply preventative treatments early in the year. However, it’s better to start late than never! If you sign up for the Basic 8 Lawn Program later in the year, you can get the full benefit the next year when we are able to start in February. Is this different from the Landscape 7 Program? What’s the difference? The Landscape 7 Program is another one of our services. It’s a program designed to take care of your landscape – including plant beds, trees, and shrubs. The Basic 8 Lawn Program takes care of just your lawn. Can I get individual services in the Basic 8 Lawn Program? While we can offer the individual services, we strongly recommend that you use the whole program. The different parts of the program build on each other, so missing one may impact the effectiveness of the others. Since we provide customized lawn care, we evaluate the best treatment for your lawn at every visit and adjust accordingly. If you are only getting one service, it may not truly be what’s best for your lawn. This is why we highly suggest the customers get the whole Basic 8 Lawn Program instead of individual services.